A fire yesterday morning gutted the recently renovated Friendship, East Bank Demerara home of a restaurateur leaving millions in losses. The origin of the fire is unknown. No one was home at the time. Despite a prompt response, the Fire Service was stymied by the heavily-grilled entryways. 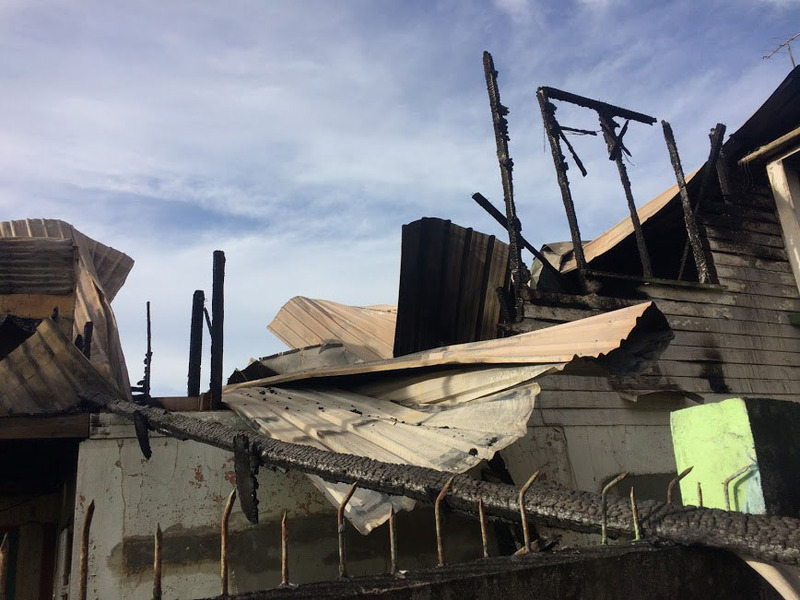 Stabroek News was told that the fire apparently started in the last bedroom of the two-storey wooden and concrete house. Neighbours said they became aware of the fire between 10:30 and 11am. 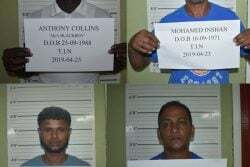 The property is owned by Padmawattie Gilgeous, 52, who lives there with her husband Linden Gilgeous, daughter Dian Bharrat, and son-in-law Rocky Bahadur. When this newspaper visited the scene, it was observed that the interior of the house was gutted and only the front and the northern side wall, along with the concrete walls of the lower flat remained. Padmawattie told Stabroek News that she was at her creole restaurant in Grove when a neighbour called and told her that her home was on fire. The still shocked woman recounted that when she arrived at the scene, firefighters were already in action. “When I came around the turn, I saw the smoke and by time I reach to the house, three quarter was already burnt,” the woman said. She added that they did not use any electrical appliance or cook before the family left home yesterday morning. She said nothing was saved from the home. According to Padmawattie, it was only recently that she renovated the home. She said her losses are in the millions as the house was furnished with all modern amenities and had US and Guyanese currency inside at the time. Meanwhile, a neighbour related that she became aware of the fire after two passersby sounded an alarm. The woman, whose house was scorched, said she did not suffer major damage though her window panes and tank were damaged. The woman recounted that when the fire service arrived, the firefighters were challenged in their battle to put out the fire by the heavily grilled home which resisted efforts to gain access. There was no problem with water as there was a nearby canal. Another neighbour, Deodat Ragnauth, recounted that he was watching cricket when his wife told him that something was burning. He ventured out of the house, he said, and saw the flames next door. Ragnauth recalled that he began to soak the southern wall of his home to prevent damage from the intense heat. “It was the most I could have done because there was no one home there and the fire was already big so I had to save my house,” he said.